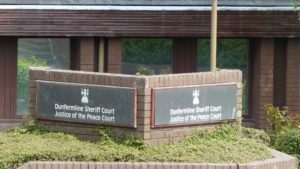 A Kelty woman has been found guilty of assaulting a neighbour during an altercation in the street. The victim was punched in the face then held her attacker in a headlock before being struck by a flying can. The violence broke out when the victim changed her mind about letting another woman baby-sit her child. The incident resulted in Debbie Hall (27), of Netherton Gardens, going on trial at Dunfermline Sheriff Court. She denied that on 19th October at Netherton Gardens, she assaulted the woman by punching her on the head to her injury. At a previous hearing last month, the victim told the court she was punched in the face and had then restrained Hall in a headlock. When the trial resumed, Hall told a different version of events saying the woman had lunged at her. Sheriff Charles MacNair found Hall guilty. The court heard she is already on a community payback order and restriction of liberty order imposed recently at Kirkcaldy.